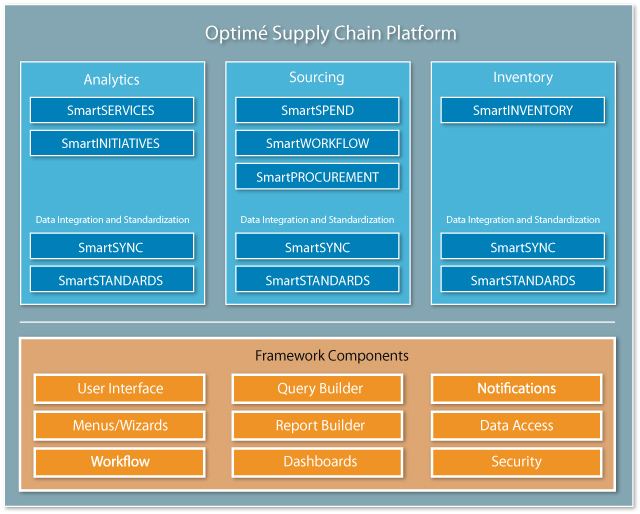 Optime Supply Chain offers a number of healthcare supply chain solutions to streamline your business, increase revenue, and improve long-term success. This business intelligence suite includes SmartSERVICES™ and SmartINITIATIVES™, and is aimed at service line (e.g., orthopedics, cardiac, pharmacy) spend. It can range from a simple contract compliance dashboard to a full patient-centric analytics platform. This suite empowers strategic sourcing and project management, and includes SmartSPEND™, SmartPROCUREMENT™ and SmartWORKFLOW™. SmartINVENTORY™ provides powerful demand forecasting and inventory optimization capabilities to help health systems match supply levels to patient demand and reduce the overall inventory levels and costs.